Gareth Bale to Manchester United could finally be happening after what feels like years of transfer speculation. The Wales international’s future at Real Madrid looks bleak after a big dip in form this season, though he remains one of the most sought-after attacking players in Europe. Various reports suggest Los Blancos would now accept around £85million for Bale, with Don Balon recently stating both Man Utd and Liverpool had come in with ‘attractive’ offers for him. 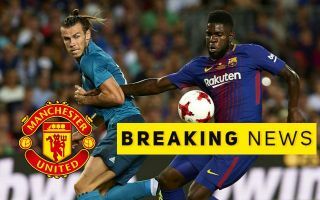 And the latest transfer rumours coming out of Spain now claim Bale is ready to snub other Premier League clubs to focus on joining United. There has also been talk of the 29-year-old joining Chelsea as part of any deal for Eden Hazard, but it’s claimed his preference would be to move to Old Trafford. MUFC could certainly do with an attacking player of his calibre, with Alexis Sanchez struggling since joining the club last January. Meanwhile, Marcus Rashford has recently made the successful move from playing out wide to getting more playing time in the centre-forward position. Bale’s pace and goal threat make him an ideal addition to give this United side more spark in the final third. It remains to be seen, however, if the Red Devils will be happy to fork out as much as £85m for the player at this stage of his career after a loss of form and some injury struggles. However, it seems he’s there for the taking if they want him.